I've been an active member of microblogging platform Tumblr since about 2008 - since then the social network has grown to enormous heights, and has been the foundation for countless grassroots efforts that manage to pop out of the Tumblr bubble and impact the world. We are the 99% is an offshoot of the occupation of Wall Street currently happening. 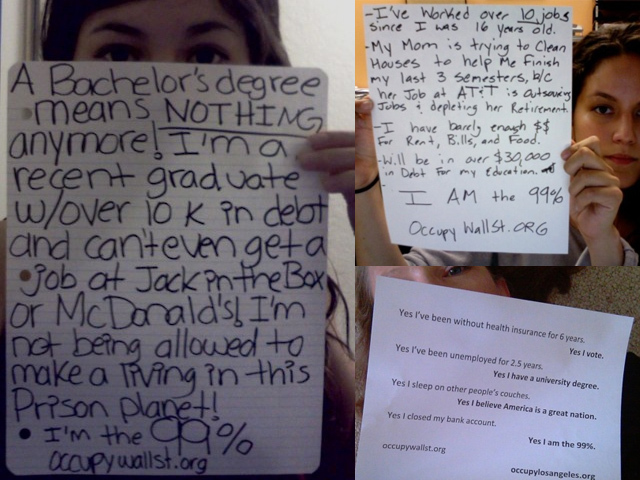 The blog showcases photos that people have taken of their current situation, ending with the phrase "I am the 99%." Here's a random sampling of some of the photos on the site. Obviously, this segment of the population feels like they aren't being represented or taken care of. Some say that they have gotten rid of their bank accounts because they feel so disenfranchised and abused by the systems set in place to take care of them. This is a ripe opportunity for a financial institution to step in and target this group. Offer maintenance-free checking accounts, flexible loans, account forgiveness and the like. But for all of the CEOs out there looking for the next market to tap into, the next best way to help your community? Start by reaching out to these people. Start by adressing needs of the 99% who need your help. Oct 3 Young & Free Marketer Meet-up a success!